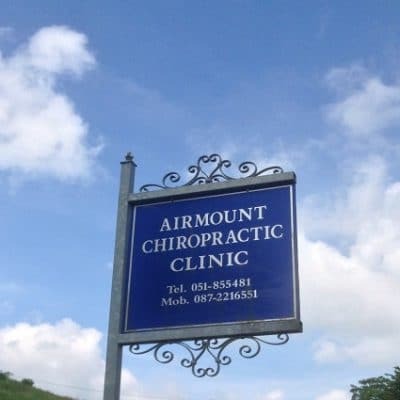 Dr. Noel Ryan established Airmount Chiropractic Clinic, Waterford, in 1981 to enhance the wellbeing of the community through Chiropractic Care. Dr Ryan was one of the founders of the Chiropractic Association of Ireland and has over 35 years of experience. Welcome to the Waterford Chiropractic Clinic – Airmount Chiropractic, where Dr. Noel Ryan has been practicing Chiropractic Care for over 35 years. Dr. Ryan studied Chiropractic at the elite Sherman College in the United States. Dr. Ryan has been working as a Chiropractor helping people with back related issues for over three decades covering the South East of Ireland including Waterford, Cork, Kilkenny and Wexford. I was having chronic pain in my neck, mid back and lower back regions. I went to Dr. Ryan over a period of time, several years ago and got very well under his care. I always had confidence in his treatment, and subsequently attend Dr. Ryan when needed and he is very accommodating.